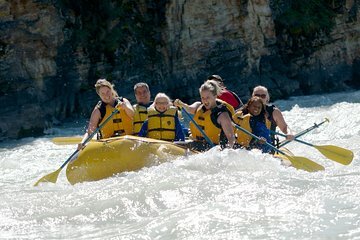 Lleve a toda la familia en esta excursión de rafting en el río Athabasca en el Parque Nacional Jasper, moderadamente desafiante, aunque totalmente divertido. Únase a un guía en una balsa de 8 personas para una carrera a toda velocidad por el cañón del río Athabasca para un viaje lo suficientemente desafiante como para ser considerado como una aventura, pero lo suficientemente relajante para que disfrute del hermoso paisaje del cañón en el camino. Las balsas para 8 personas garantizan la seguridad y la protección y un ambiente de grupo reducido. An interesting assortment of passengers from Nepal, Germany, and the Netherlands. Lots of spray and laughs. Worth the money. Was totally awesome...an hour and a half of adventure, new friends and unbeatable natural beauty. The only sort of negative thing was the wet suit and life jacket were a bit stinky. They could probably spend a bit more energy on sanitizing the gear between each usage. We had an excellent time on the river. Our guide, Sean, was very knowledgeable and fun. It was definitely a highlight of our trip and we would recommend this tour. The trip was fun. The guides are organized and informative. The run was easier than we anticipated but we still enjoyed it. Next time I will attempt a more challenging run. Good for families with younger children. We had a great time. Good company, very organized, friendly, knowledgeable staff. We will be going again and with Rocky Mountain River Guides. Great fun! The crew was great. Really fun way to enjoy the beautiful scenery.